I'm usually not a lazy person. Really I'm not. A few years ago I was looking for a weather station gadget to hang above my entry door. Lots of RVs have them, or at the very least, a clock. I figured something that did Indoor/Outdoor Temperatures and the time would be great. As usual, I ended up with a full-on weather station with remote outside temperature and an anemometer. Heck, I can't even SAY anemometer, but I have one to measure wind velocity. Not that I really ever use it... The base unit was a picture frame sized piece that used screws and keyhole shaped receptacles on the back to hang it. I thought I was smarter and I didn't want any screws in my walls. Besides, all my walls and ceiling are covered in a VERY Velcro friendly carpet. I should simply be able to attach some Velcro to the back and hang it up. Sure, that worked. For a while. Then it didn't... catastrophically. You see, high temperature and humidity are the enemy of adhesives. Heat them up enough and add some humid air and they will eventually fail. Usually by getting all gooey and stretchy until whatever they are holding falls. In my case, as I closed the main entry door...all the way to the step and CRASH, broken plastic all over the place. I picked up all the pieces and realized that just the outside transparent trim plastic was shattered, but it was still working. Sort of. After a little bit of disassembly and soldering it was all OK. You see, most of the double-sided tape had come loose from the Velcro and was still attached to the overhead carpet. Time to rethink. It's not that the tape idea was bad, but rather that I used the wrong kind of tape. 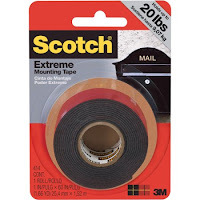 After some research, I found that not all double-sided adhesive tape is created equal. In fact there are LOTS of different kinds. The trick was picking the correct one for the job. The white stuff I had used was a good name brand (3M) and was rated for indoor use. Each piece should hold 2 pounds and the weather station weighed much less than that. But the tape wasn't designed to withstand high temperatures like those found in a closed RV in the sun...for any length of time. After looking at many competing products I bought the 3M Extreme double-sided tape, rated for indoor and outdoor use and able to hold 20 pounds. 10 times more than the other "regular" style. This stuff is sticky! Once a single side is peeled and placed on the back of whatever you are installing, press down and rub a few times to make sure it sticks all the way across the tape. After that, remove the other side of the tape and attach sticky or non-sticky Velcro right over the tape. The Velcro I have is the same width of the tape so it was easy. If you need to, trim accordingly. Press it all down again. Place whatever you are hanging or attaching where you want it and press it down securely. Done. I didn't mess with it for a day or so, then when I want to take it off (like I would to replace the batteries) it pulled away nicely. Just the Velcro this time, still attached to the weather station unit. Result! This stuff can definitely be used on all sorts of projects. Be careful applying it to places you can see. It appears that it will be very difficult to remove! Thanks, Rich. I've had some of the same issues with double backed tape. Your article is very helpful! One other trick I learned (the hard way, of course) is that smaller items can use the same "hook and loop" tape used to stick toll transponders (EZ-Pass and the like) to windshields. The need a high-temp adhesive. I use it for the 2-button remotes for our MCD blinds. Found it (where else) on Amazon. Yup, that tape is amazingly strong! We found Gorilla double side sticky tape that holds 30 lbs. That is all we use now to hang stuff in our bus. Great stuff! How is that stuff to REMOVE, once you've decided take it off?